Wales international Scott Williams says he would have preferred to renew his national dual contract (NDC) than sign a conventional deal with the Scarlets. The 25-year-old centre will stay with the west Wales region until 2018 after signing at Parc y Scarlets last week. That followed the Welsh Rugby Union withdrawing their offer when the regions "upped the ante" during talks. 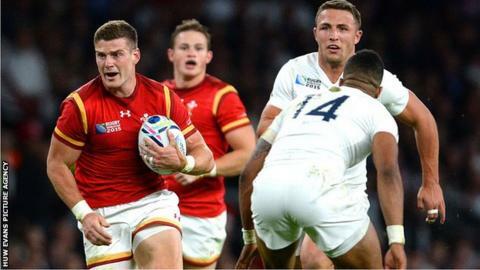 "I would have preferred to have been on an NDC but things didn't quite work," Williams told BBC Wales Sport. "But but the most important thing is that I'm staying with the Scarlets." Williams has been on an NDC - which sees the WRU pay 60% of the wages - since March, but the union's controlling interest in the player will end in the summer of 2016. Their offer was withdrawn amid an accusations of a bidding war for the player among Wales' regions. WRU chairman Gareth Davies explained at the time: "some of the regions started upping the ante, as it were." Williams is currently sidelined with a knee injury, but says he was flattered by the offers. "It's great to have interest from other clubs, but I've said all along that I wanted to stay and they sorted it out in the end, so I'm happy everything has worked out," added Williams. "With the injury it was a little bit worrying, but I'm just happy everything's sorted so I can just focus on my rehab." Williams is in his second season as Scarlets vice-captain, but has not played since Wales' 28-25 World Cup win over England at Twickenham. "I'm on track, I don't want to push things too much. I want to make sure it's right first but I've given myself a goal of playing before the end of the season,"
"But if it's not right, I'll leave it." Williams though is looking forward to next season and playing in midfield with Jonathan Davies who will return to Scarlets from Clermont Auvergne in the summer. "Jon is a world class player and he's proven that in the last couple of years,"
"He'll be a massive player for us next year so I'm looking forward to playing with him again," added Williams.